One pound of delicious Amaretti de Saronno cookies in a distinctive tin. 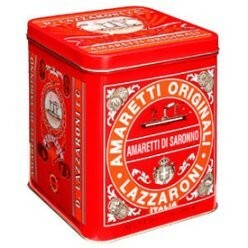 This distinctive tin contains one pound of Amaretti di Saronno cookies. According to legend these crisp airy cookies were first created in 1718 to honour a visit from the Cardinal of Milan. Two young lovers baked a mixture of sugar, apricot kernels and egg whites to create the unusual bittersweet flavour and wrapped the cookies in pairs to symbolize their love. A perfect complement to coffee at any time of day. The delicate and delicious flavour of Amaretti di Saronno cookies may also be enjoyed on their own.